The US has imported crude oil for many decades. The following data (1970 – 2015) comes from the Energy Information Administration of the US government. 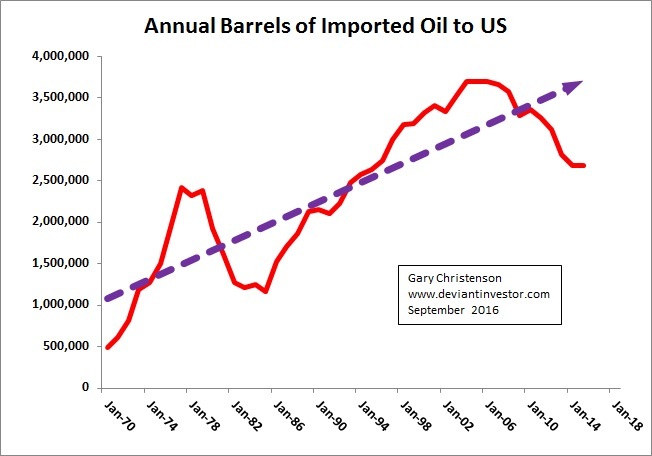 This data shows reported barrels of crude oil imported into the US. Imported crude oil has increased erratically since 1970. Imports are down somewhat since 2008 due to the rise of fracking and the ongoing recession. I plotted the approximate expenditures for imported oil by taking the average price for a barrel of crude oil each year and multiplied that price by imported barrels. Excel calculated an exponential curve that shows the huge increases in expenditures as well as the dramatic recent decline since 2011 due to reduced imports and much lower prices. 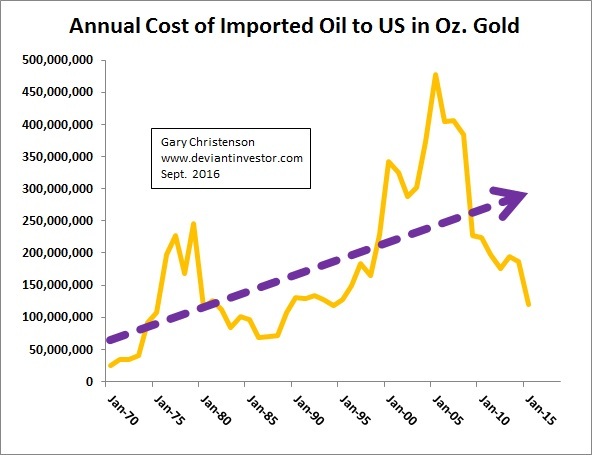 Now consider the cost of imported oil measured in ounces of gold priced at the annual average price each year. 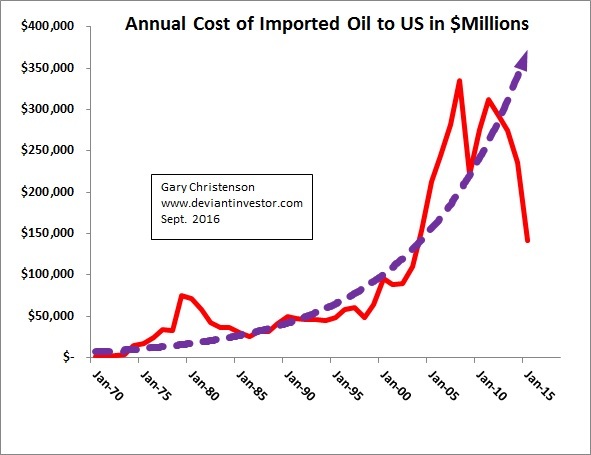 The cumulative cost of imported oil since 1970, if priced in gold, would have been 8.2 BILLION ounces of gold. Assume that Fort Knox still contains 147,300,000 ounces of physical gold. Yes, this is a stretch, given that the gold was last audited in the 1950s, but pretend the supposed hoard of gold is still vaulted there. 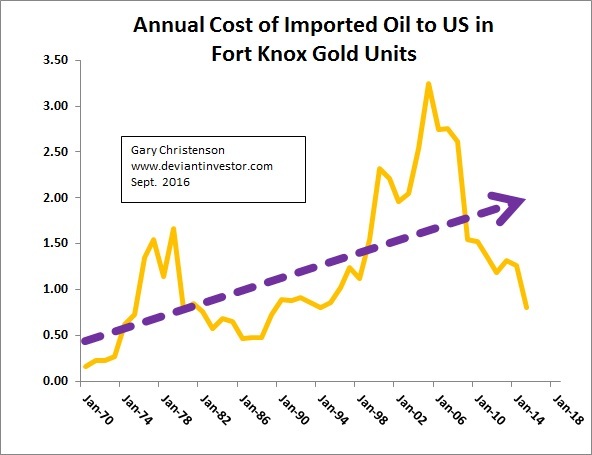 The above graph shows the cost of imported crude oil in “Fort Knox Gold Units,” or the number of times the total Fort Knox Gold would have been sold each year to pay for imported crude oil. Total cost for imported oil 1970 – 2015 has been approximately 55 Fort Knox Gold Units. The US and other countries consume more energy each year. Crude oil is a major source of energy. The US runs a trade deficit of about half a $ Trillion each year, much of it is due to the cost of imported crude oil. If the US had paid for imported crude oil in gold, the total cost since 1970 would have been approximately 8.2 BILLION ounces of gold. Clearly this was not possible since the total US official gold hoard is listed as about 260 MILLION ounces of gold, of which 147.3 million supposedly is vaulted in Fort Knox. It is easier to print T-Bonds and IOU’s than to mine and produce gold. The US dollar is currently the reserve currency of the world. This enables the spiral of borrow, spend, delay payment, and live beyond actual production that the US government has encouraged for many decades. If it were not for an aggressive foreign policy and a powerful military, crude oil exporters might not accept T-Bonds (IOUs) and might demand gold or other real goods in payment for the crude oil needed by the US economy. This could become disastrous for the US standard of living. Expect continued US military presence wherever there is oil to be imported. The process by which the US imports goods and exports reserve currency T-Bonds (debt IOUs) will not last forever. When it implodes expect devalued fiat currencies, higher prices for imported energy and commodities prices, and of course, much higher gold and silver prices. It should be clear that higher prices for necessities such as energy, food, and all imports will reduce the standard of living for the majority of Americans. Loss of reserve currency status for the US dollar will be financially catastrophic for many individuals and businesses. Diversions and force may be needed. When you can see the road ahead, preparation is sensible.